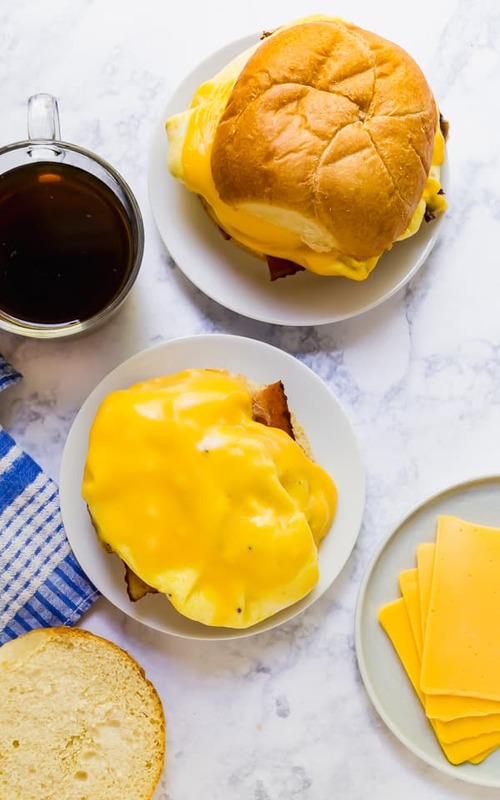 This Cheesy Bodega-Style Breakfast Sandwich is the most delicious and authentically “New York” way to start the day! 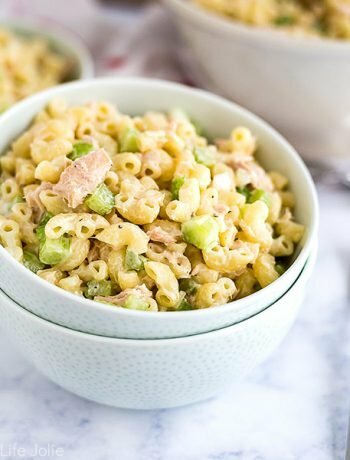 This is a sponsored conversation on behalf of Land O’Lakes and The Feedfeed. As always, all opinions are my own. Thank you for supporting the brands that help support this blog. This post contains affiliate links. Please see the disclaimer here. Fun fact: when I was 19, I moved to New York City with nothing but a few thousand dollars and a dream. I had a boyfriend at the time who had already set up shop with some college friends in a long-term sublet in Hell’s Kitchen. It was an insanely low price because they were gutting the building next-door and would be moving onto our building afterwards. It was awesome and a little bit terrifying. I lived in NYC for a total of five years and while I’m now happily settled in the suburbs, there are a few aspects that I miss about big city life. 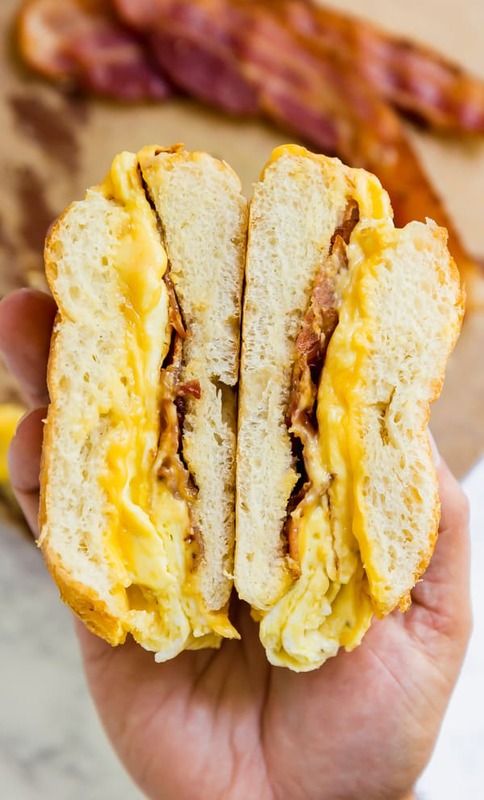 One thing is a New York City classic: the bodega-style breakfast sandwich. Before I lived in the Big Apple, I didn’t know what a bodega was. I came to learn very quickly that a bodega is a locally-owned convenience store and deli. You’ll typically find some very basic grocery items and of course an assortment of munchies and beverages. Often, they have a flat top where they can make an assortment of hot subs and the best darn egg sandwich you’ll ever taste! The more fancy-shmancy bodegas sometimes also have a salad bar-type situation (usually these can be found in lower Manhattan areas like SoHo and Tribeca). Most New Yorkers tend to get on friendly terms with the owners and workers at their local bodegas. The guys at the bodega near each of my apartments over the years quickly learned exactly how I liked my late-night cheesesteak and more importantly, my bacon, egg and cheese sandwich! 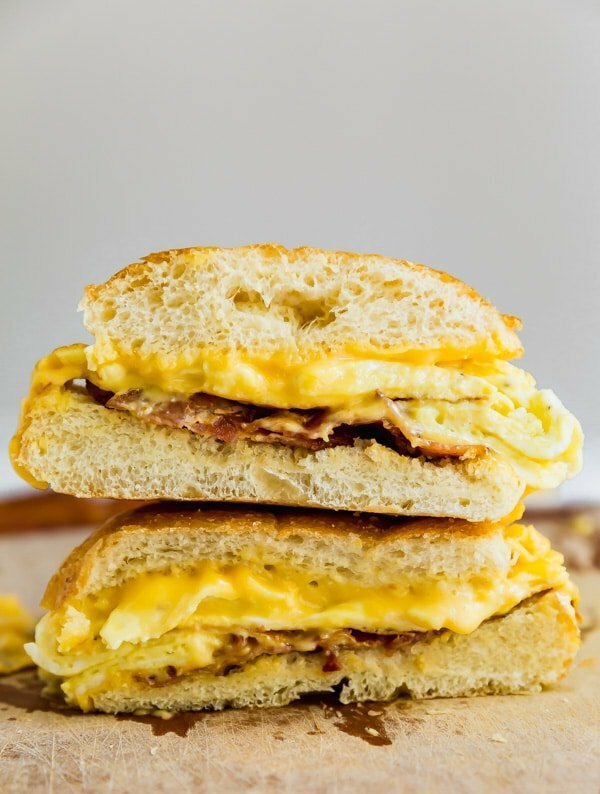 There are a few very important components when it comes to making the ultimate bodega-style egg sandwich recipe. Obviously, there are scrambled eggs and crispy bacon. Some people opt out of the bacon, and if pork isn’t your cup of tea, feel free to leave it out. I’m including it because I love the savory, crispy goodness that bacon brings to the proverbial table. Now, I know that in some fried egg sandwiches, you find all sorts of varieties for bread options. I’m keeping my version true to the real-deal bodega sandwiches that I still dream of by making it on a roll, just as the bodega gods intended. Which brings me to another very important aspect: Deli American. 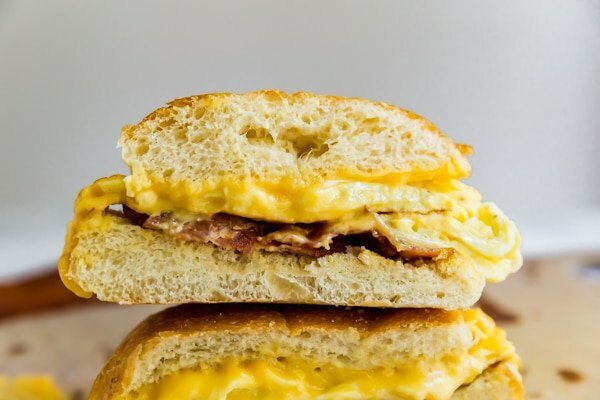 There is nothing more fantastic than some wonderfully melty Deli American on your breakfast sandwich. And when it comes to Deli American, I like to go with the very best, Land O Lakes® Deli American. These are the creamy slices I grew up eating as a child and the very same ones I give to my own children, which they happily devour and beg for more! Fun side note: My mom came over the day I was photographing this, and when she saw my bag full of Deli American slices, she got all excited and started waxing poetic about how they’re her favorite! At Land O’Lakes they spend a lot of time thinking about what they put into our food, so that we don’t have to. 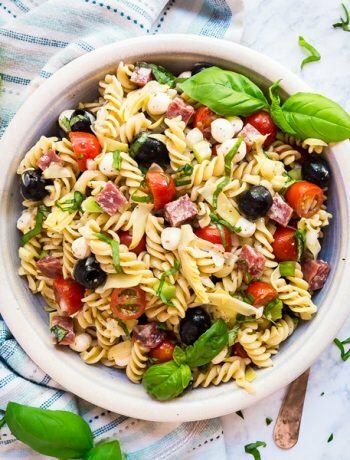 So, you know that you’re only getting high-quality products, which is one of the reasons that Land O Lakes® Deli American is America’s #1 Deli American! Fry your bacon up nice and crispy. Soggy bacon need not apply! I like to lightly toast my bun for a couple minutes in a warm oven. And if you’re feeling extra fancy, you can even butter the bun halves first. 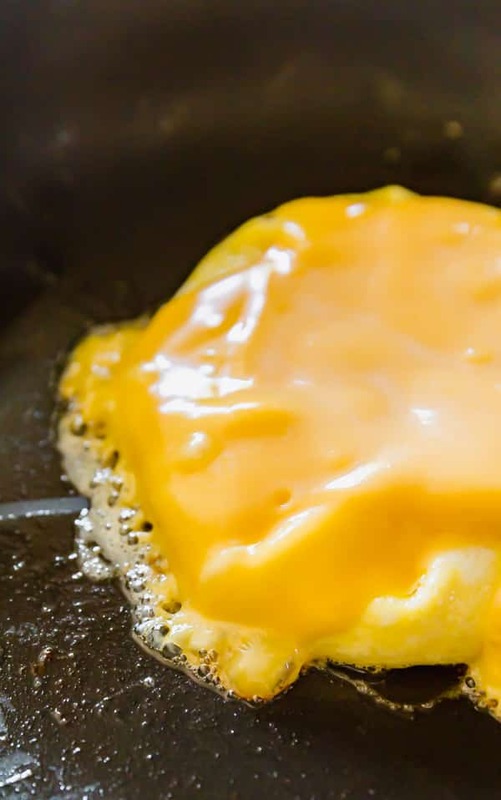 In terms of cooking the eggs, I’m sharing a seriously easy and fool-proof method I learned years ago from the fantastic Deb Perlman from Smitten Kitchen in a post she wrote over at Cup of Jo where she started making the scrambled egg mixture similar to a crepe and folded it over onto a slice of cheese. Speaking of slices, I added not one. Not two. But three Land O Lakes® Deli American slices. Trust me when I say, this was an excellent life decision. I strongly encourage you to gobble this down with a nice hot cup of coffee! Because the eggs cook so fast (literally, in a matter of 2-3 minutes! ), this is a seriously great option to bring to a tailgate. If you’re anything like us, when we go to games, we start early. Make a bunch, wrap them in wax or parchment paper and then in foil, and your friends will be eternally grateful! In a large fry pan, melt the butter over medium heat, spreading it around to evenly coat the pan. While the butter melts, whisk together the eggs, a small splash of water, salt and pepper until well combined. Pour the egg mixture into the pan and swirl the pan a bit to spread out the egg so that it makes one thin layer, like you would if you were making crepes. Let the egg cook for about 30 seconds and place one slice of Land O Lakes® Deli American in the middle of the egg. Let it cook another 30 seconds until there is no longer liquid that spreads when you gently poke the edge of the egg with a rubber spatula. 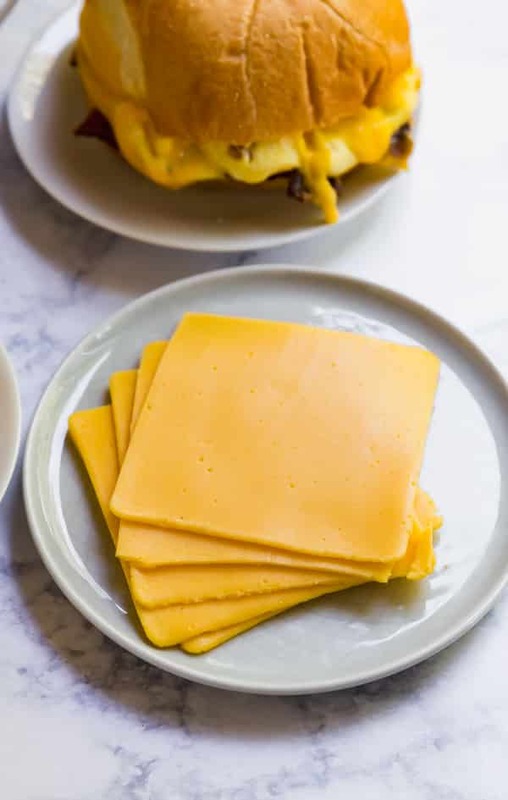 Fold all the edges of the egg up and over the cheese to completely cover it and place 2 more slices of Land O Lakes® Deli American on top of the folded egg. Cover the pan for another minute or until the Deli American has melted. Place the 4 halves of bacon on the bottom bun. 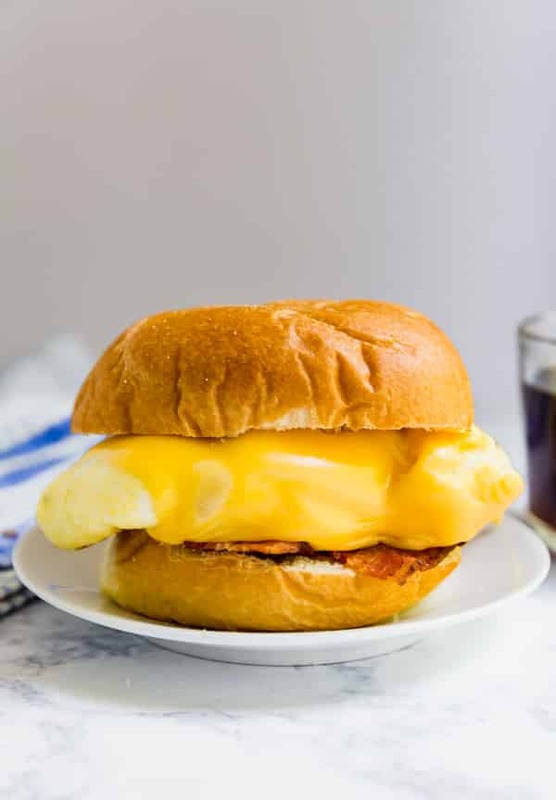 Top the bacon with the folded egg and Deli American and put the top of the bun on top of the egg and Deli American. Serve immediately. Looking for some other tasty breakfast recipes?